Oh, thank goodness. I was wondering about the Hannibal Lecter mask, too, until I realized it was a teddy bear. What I didn’t realize is that the teddy bear has a name. Dude, you need help. Ok, is there still anyone who still doesn’t understand my, and my former alter ego kitteh’s, complaints about “age inappropriate marketing items”? Would I ever use these? 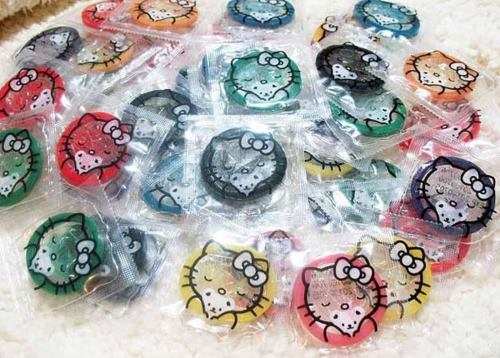 Nope, not only b/c it’s HK, but mainly b/c I don’t know which brand of condoms these are. But if I came across them, I might get one as a novelty item, never to be used…. But do they really taste of Hello Kitty?